(Mineola, NY) - The Herricks Association of Girl Scouts recently held their annual Awards Ceremony to honor the Girl Scouts who have earned their Silver Awards. The ceremony is a milestone in the life of any Girl Scout. 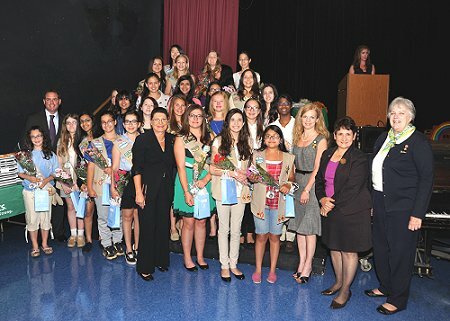 Nassau County Clerk Maureen O’Connell joined other area officials, the leaders and families of the Herricks Association of Girl Scouts to honor and applaud these young women who have demonstrated enormous dedication to community service. Clerk O’Connell presented each of the honorees with Citations in acknowledgement of their wonderful achievements.